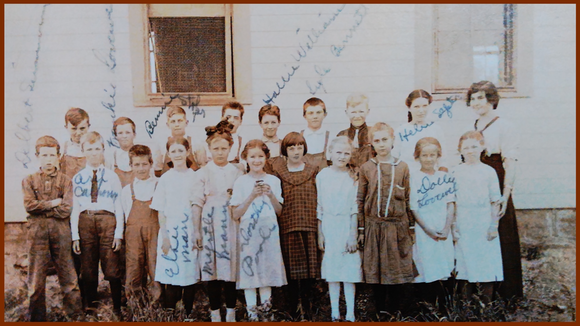 A picture printed in the 1979 volume of family lore, “The Lovewell Family,” showing children from the Lovewell area standing in front of their school in the early years of the 20th century, somehow never tugged at my sleeve for attention. It’s not that there weren't faces there that I might want to see. The problem was that the faces themselves were almost invisible. Several photos in the book managed to survive the printing process in good form, but this was not one of them. It may have been faded already, even before the step of halftoning, or reducing the light and dark gradations into a series small printable dots, took its inevitable toll. The result was no more than blotches of faint gray pinpoints with a caption attached. Happily, a beautiful sepia copy of the school portrait is among the treasures forwarded to me by Ashley Gresham, and the faces of the children are now as memorable as their names, many of which are inscribed across the print in cyan ink. Containing images of William Frank Lovewell’s boy “Frankie," better known as James Franklin Lovewell, the husband of Gloria Gaye Lovewell, Mary Lovewell Stofer’s son “Bennie,” and Stephen Lovewell’s daughter Dolly, the picture was bound to be a favorite among Lovewell descendants. However, the interesting bits don’t stop with pupils whose parents were Lovewells. Hall “Hallie” Williams was the son of longtime Lovewell resident Steve Williams, who had been Thomas Lovewell’s hired hand in 1880. The little chap with his arms folded defiantly is my dad’s uncle Delbert, who can be seen with a catch of tuna in Ventura, California, in another picture on this site taken in the 1940’s. Standing next to Helen Septer in the back row is a red-headed gentleman I knew for years in Formoso, the seemingly ageless Harold Morris. About the time we were editing a book about her hometown, my mother informed me that Harold had finally begun to show his age. He was 87 when he died in 1990. I won’t try to date the photo more precisely than to say that it must have been taken around 1915. Helen Septer turned twelve that year, and she makes a convincing twelve-year-old, standing shoulder-to-shoulder with her teacher, Miss Marie Winger. The year can’t be earlier than 1913 because of someone else who’s in the picture. The sober little girl near the center of the front row, wearing dark clothing and looking rather like a refugee from the Addams Family, is Margaret McDonald. Perhaps her image is haunting only because I know her backstory. Dave Lovewell and I went back and forth for days at the end of 2014 deciding what had happened to Margaret’s father, Will McDonald, back in 1913. I believe we ended up agreeing that his shooting death was very likely an accident, even though the funeral service for the Catholic farmer from Cuba, Kansas, was conducted by a Methodist pastor, with interment some distance from the cemetery which his own mother had donated to St. Isidore’s in Cuba, because Will McDonald's hand had wielded the gun that killed him. Anyway, that’s how I interpreted the events surrounding Will’s passing, though there may be another, simpler and less factitious explanation. Whatever she had been before the death of her husband, afterward Addie McDonald was a devoted Methodist. She brought the family to Sinclair township in 1913, settling on the farm south of Lovewell which Will had prepared for their arrival. She and her six children spent Christmas of 1914 as guests of her father, Frank Sager, who three years later would sue her to quiet a claim. Sager’s relationship with his children was evidently mercurial. In September 1914 Frank cracked open a mysterious crate that arrived by express from Florida, unveiling a pet alligator, an unexpected and probably unwelcome gift from his son, Frank, Jr.
Addie McDonald’s time in Jewell County would be short. Following a brief illness she died at a Kansas City hospital in 1921. At 51 years of age, the mother of twelve was survived by only six of her children. Margaret’s appearance in the photo can serve as a reminder that even though we had crossed the line into the 20th century, by 1915 Americans were only beginning to emerge into a modern era in which most parents did not have to bury their children.